Skills development has many functions – economic, social and cultural. Skills are central to success in the complex, rapidly changing economy of the 21st Century, and they are also an important way for people to achieve fulfilment, to be happier and more confident. 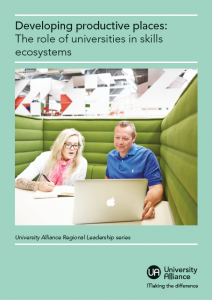 Our latest report, Developing productive places: The role of universities in skills ecosystems examines the case for universities to be a major player in meeting the UK’s skills needs. Click on the image (right) or the link above to download the report. We have also published a number of case studies from our universities – read them here.